Hema Malini (born 16 October 1948) is an Indian actress, director and producer, Bharatanatyam dancer-choreographer, and a politician, well known for her roles in Hindi cinema. She made her acting debut in Sapno Ka Saudagar (1968). She went on to appear in numerous Bollywood films, most notably those with actor and future-husband Dharmendra and with Rajesh Khanna. Malini was initially promoted as "Dream Girl", and in 1977 starred in a film of the same name. During this period, she established herself as one of Hindi cinema's leading actresses, noted for both her comic and dramatic roles, her beauty, and her accomplished classical dancing. Malini is one of the most successful female film stars in the history of Indian cinema. Appearing in over 150 films in a career span of 40 years, she has starred in a large number of successful films, and her performances in both commercial and arthouse cinema, were often recognised. During her career, she has been nominated 11 times for the Filmfare Award for Best Actress, of which she won once in 1972. In 2000, she was presented with the Filmfare Lifetime Achievement Award. In the same year, she was honoured with the Padma Shri, the fourth-highest civilian honour, by the Government of India. In 2012, the Sir Padampat Singhania University conferred an Honorary Doctorate on Malini in recognition of her contribution to Indian cinema. She also served as the Chairperson of the National Film Development Corporation. She was awarded the prestigious "SaMaPa Vitasta Award 2006" in Delhi by SaMaPa "Sopori Academy of Music And Performing Arts" by Music Legend Pandit Bhajan Sopori for her lifetime contribution and service to Indian culture and Dance. Of late Malini spends most of her time on charitable and social ventures, while making occasional appearances in films. She is a member of India's Bharatiya Janata Party and was nominated member by the party in Rajya Sabha, the upper House of parliament during 2003–2009. 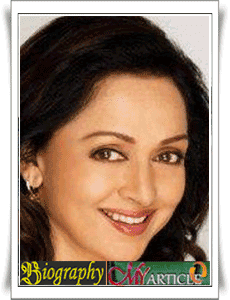 Hema Malini Chakravarty was born into a Tamil speaking Iyengar family in Ammankudi near Orathanadu to V.S. Ramanujam Chakravarthy and Jaya Chakravarthy on 16 October 1948. Her mother was a film producer. Malini was the youngest of the three children and has two brothers. She was not interested in academics but enjoyed history, her favourite subject in school. She was educated at Andhra Mahila Sabha in Chennai. She studied at DTEA Mandir Marg till class 10 but did not complete class 10 when she got into acting.